Played my first 2 games of WFB 8th ed at the Intro Party Plastic Legions hosted. The game is exactly what GW is looking for: fun, fast and furious. The new charge rules (base movement + 2D6) had the armies fighting by turn 2. And the magic rules had wizards throwing mega powerful spells each turn (when they were not blown up by miss-cast). Combat results where extreme with handfuls of casualties taken each turn – my high CR for the day was 20. The new combat rules had all players throwing huge blocks of troops on the board. I ran my Warriors of Chaos with a block of 50 Marauders + 3 units of Warriors, my Skaven opponent only played 3 units and my Empire opponent fielded a 60 man spear unit with 2 detachments of 30 swordsmen! Both games were more or less over by the 4th turn as the large units smashed each other with dozens of attacks. I find it funny that GW fixed all the things I hated about WFB when I started playing 10+ years ago. Every model fights. Movement is not figity. Leadership is not the most important statistic. The game is just like 40K, but different. 10 years later – I’ve grown accustomed to playing a game of blocks and movement. I expect leadership to be important and I like the fact that a plan is required. The new edition plays so fast and smooth, the game almost plays itself – all the player needs to do is push the units forward and throw many, many dice. As part of an ongoing Warhammer Fantasy Battles campaign, our group spent a night playing warbands. Great fun playing 4 games at 500 points each. We followed the Adepticon warband rule set for army construction. Its been a long time since I’ve played in a tournament – big change of pace to run a game in 50 minutes instead of the leisurely 3 hours the campaign games have taken. Of the eight players, my list was the only one without a character. In such a small list, 150 points is a huge price to pay for a hero. Instead, I invested the points in 10 Chaos Warriors! Having 44 models can not only overwhelm an opponent, but it will overwhelm a deployment zone. I frequently found myself with units deployed 2 or 3 rows deep. The list played best against other combat lists (Chaos, Orks) and struggled against shooting armies (Empire, Wood Elves). If I were to run this list again, I would increase the size of the Warrior units to 7 or 8. Frequently, out numbering was the only bonus to combat resolution. Having a half rank to draw reinforcements from would make the Warriors even more formidable. Try out some thing new – paint metals just like any other color by mixing from shade to high light. These Chaos Warriors are spray prime black with a top to bottom base coat Graveyard Earth (GW). 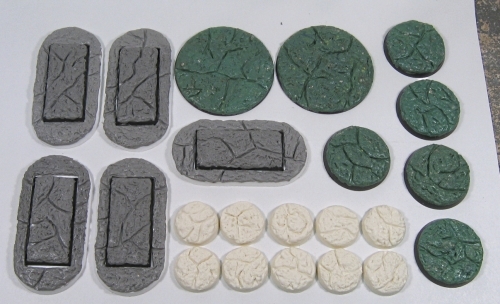 Armored plates are a 50/50 mix of Graveyard Earth and Chainmail (GW), with high lights of pure Chainmail. A silver like Chainmail is not much more than a white tone – mix in a brown for grunge or green for corrosion. While I have not tried it, I would imagine Red and Brass would go together like a bucket of lava. 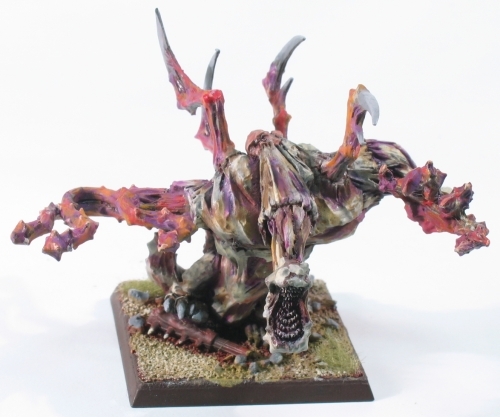 An old model which finally received its paint job. 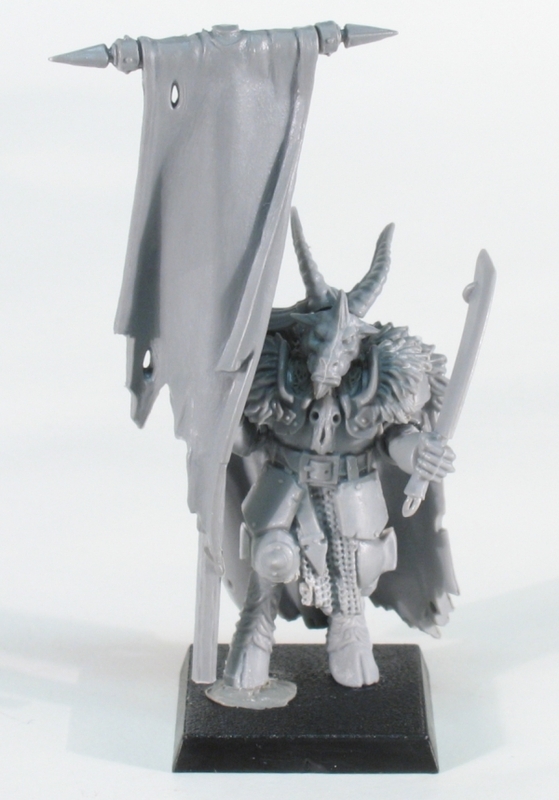 Converting my 6th ed Beast of Chaos army into a 7th ed army lead me to adding a Battle Standard Bearer. 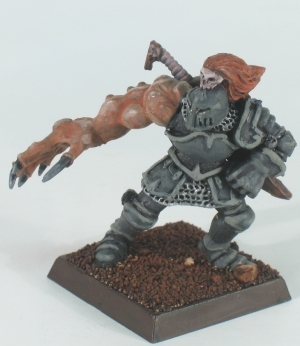 Wanting something quick and inexpensive, I converted a Chaos Warrior body with Beastman arms, legs and head. Most of the work was done with side clippers & exacto – with the warrior cape covering up most of the damage to the knees. A small ball of putty supports the head, together with a few strokes of the sculpting tool to blend in the new neck. All told, I may have spent more time digging in my bitz box for parts than working on the figure. 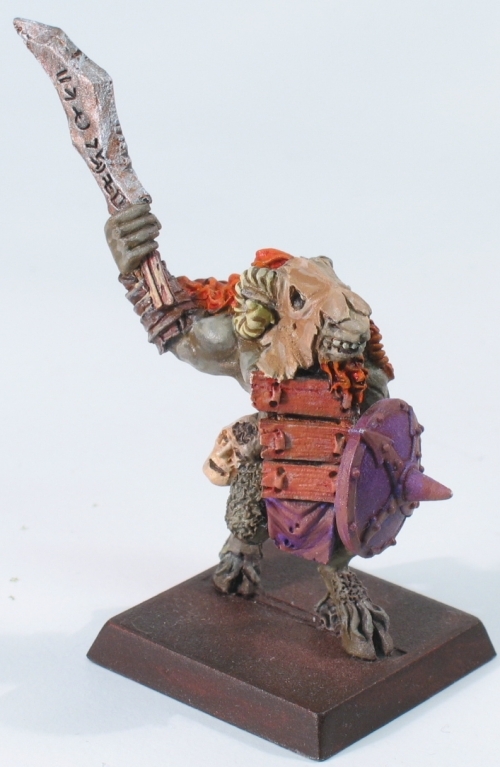 Three champions of chaos converted from various bits and pieces. The Undivided Champion’s body is a metal chariot rider, with an arm from the mutation sprue and an sword from the Chaos Warrior kit. 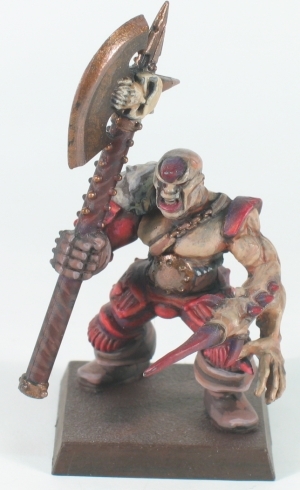 The Khorne Champion is built with parts from the old Chaos Warrior plastics and the chaos mutation sprue with a torso and shoulder pad from the Marauders kit. 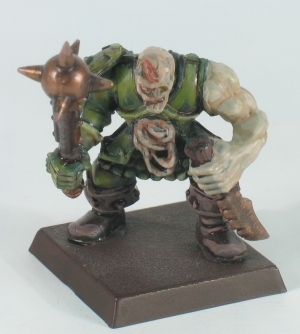 The Nurgle champion is once again built using the old Chaos Warrior bits plus the head and guts from the zombie kit and what I think is an ork arm. 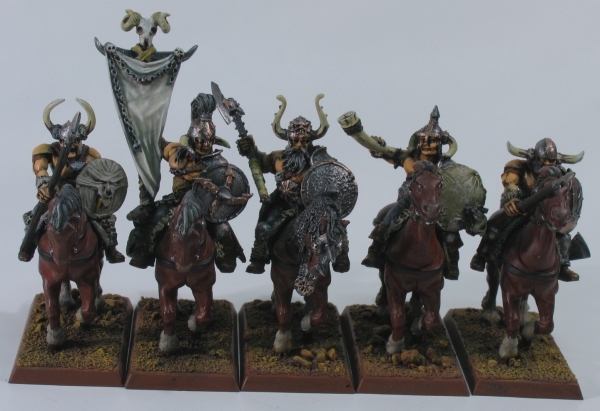 Two Chaos Cavalry units, seldom played but still taking up space in the army collection. 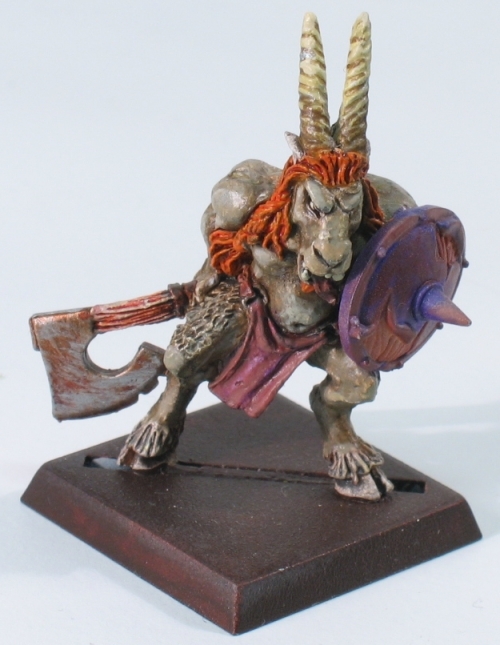 The Marauder Horsemen are the best sort of figures – free. 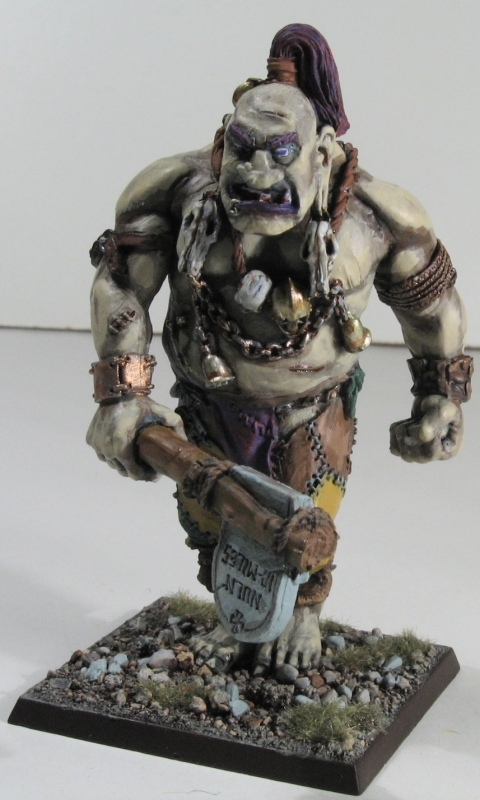 Many years back, a local game store was given this unit by the local GW rep as a pre-release display piece. In exchange for painting the unit, I received the models after short stay in the display case. 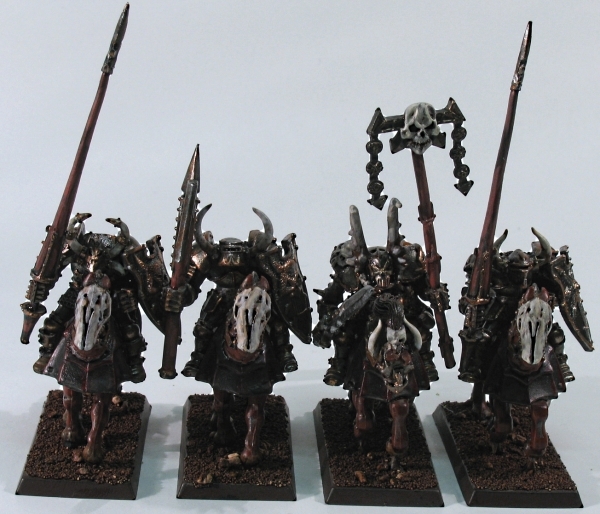 The Khorne Knights are plastic/metal hybrids from early 2000. Does not matter how many pins are used – the limbs spend more time off of the model than on. Last time I check the rule book, the small 4 man unit with the mark of Khorne packed a might punch. I’m sure with all the changes GW as made to the Chaos roster they now qualify to work as water boys. Pair of metal Chaos Spawn from Games Workshop. 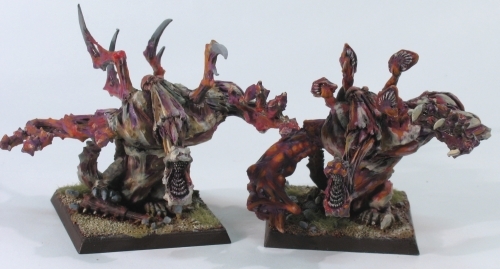 The spawn on the right is converted with the head/torso from a flamer demon & has the back spines replaced with flamer arms. 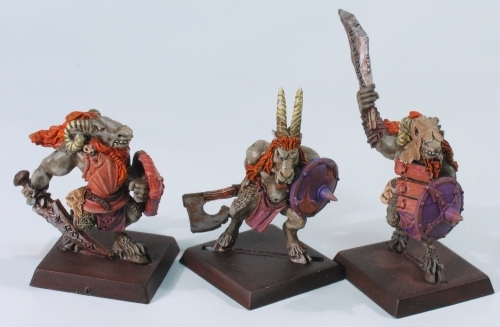 A set of Beastmen dating to around 2003. 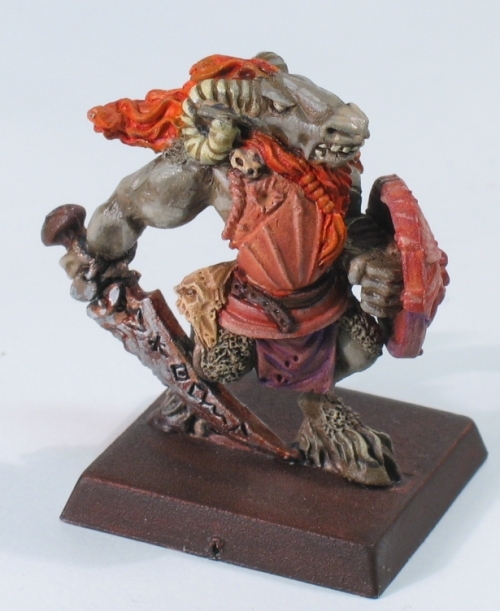 Originally painted for a dungeon crawl game played at the first Adepticon – I’d almost forgotten that I still owned these until I found them hanging out with the rest of the chaos army. 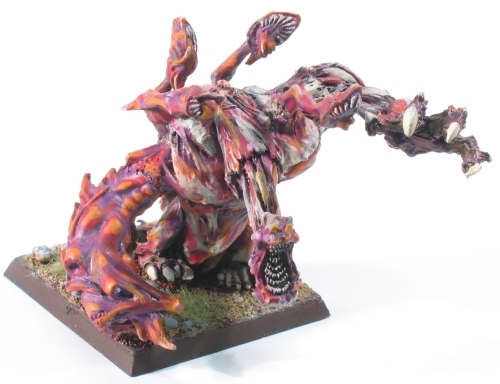 The new demon armies provide gamers the opportunity to play one set of models for both 40K and WFB. 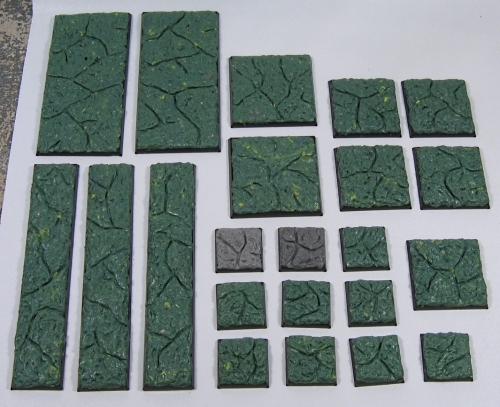 The lava bases project is for a friend of mine who wanted a complete set of bases for an upcoming chaos army project. All that’s needed is either a pinning or magnet system to flip an army from one system to the other. 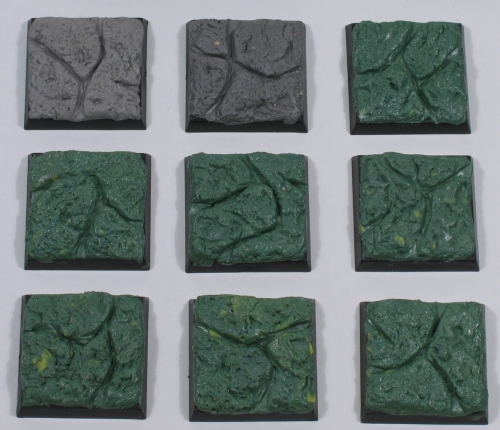 The bases are green stuff/procreate over plastic bases. Texture is applied with a concrete rock, then lava channels are added with a wire hook tool and a standard sculpting tool. Hardest part of the whole project was mixing up all the green stuff – the bases used up a 30 inch roll of GS. I spent more time mixing than sculpting. FYI – don’t let your green stuff lay around too long. The roll I used was stored in the freezer for 6 years, causing the yellow portion to develop a skin that mixed poorly with the blue portion. The bike/cavalry bases are designed to go from square to round. The square cav base slots into the open space on the round bike base. You are currently browsing the archives for the WFB category.